There is Michi-no-eki (road station)"Hana-no-sanseien Izu Matsuzaki" in the middle of a prefectural-road Shimoda Matsuzaki line. It is the entrance of the Oosawa hot spring here. 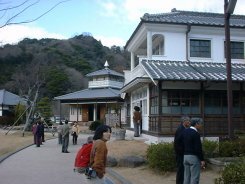 It is said that the Oosawa hot spring is the oldest watering place in Matsuzaki. "Kajika-no-yu" is in this Michi-no-eki. There are a main bath and an open-air bath. Although it is small, there is a clean rest room. The next door of the bathhouse is a buckwheat- noodles shop. The bathhouse of a hot spring is felt small. Although it cannot say that inside is large, fundamental facilities are ready and it is satisfied. An open-air bath is in the second floor. I was able to go directly through stairs from the bathroom. Since there is a fence, I am not seen by scenery out of an open-air bath. However, since I stand up, the scenery of the opposite shore in Nakagawa- river is in sight. The view is good. Water was made a little hotter. 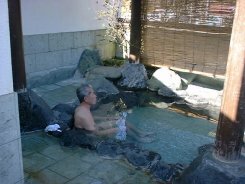 The nature of the water of a hot spring is an alkaline simple hot spring. The temperature of the fountainhead is 48.5 centigrades. A reception desk close at 19:30. Get down from Numazu IC of a Tomei expressway, and go south via the national highway 1, and the national highway 136. A car parking space is large. 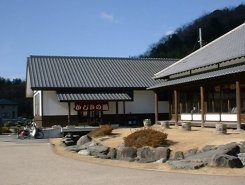 This Michi-no-eki (rest station of the road) is called "Hana-no-sanseien Izu Matsuzaki." There is a large and beautiful yard of the Japanese garden style of grass. Sansei (three great men) is three famous people on the history of Matsuzaki, such as Benzo Ida famous for the Hokkaidou exploitation. There are cherry tree roadside trees from the Oosawa hot spring with Michi-no-eki up to the town in Matsuzaki. Probably, the cherry tree roadside trees are wonderful in spring.